The overall objective of any landscape design, including urban landscaping, is to create a space that breathes with the home and has a relationship to its surroundings. It should reflect your visual desires and function together in every aspect. An urban yard or garden comes with big challenges. Perhaps your property backs up to the two-story blank wall of a neighboring townhouse. Maybe the space is all straight lines and right angles. Or you’ve remodeled your home which involved changing the elevation, adding a new room or reducing the size of your backyard, all of which affect the spatial relationship to the overall landscape. With urban landscaping, as with all landscape architecture, the goal is to create spaces in which the home and architectural elements have a relationship with its natural setting. For starters, consider the big picture—your assets and liabilities. Begin by looking at the large, possibly immoveable factors, such as trees, a long fence-line or pool machinery and equipment, and decide if they are liabilities or assets. In this way, you test the landscape garden design options. Landscape designers or landscape architects can bring expertise and experience to this process. Pathways. Functionally, pathways provide a way into the space. Visually, they lead the eye in, through, across and around the landscape design. Pathways can have a big impact on your experience as you transition from the street into the landscape. 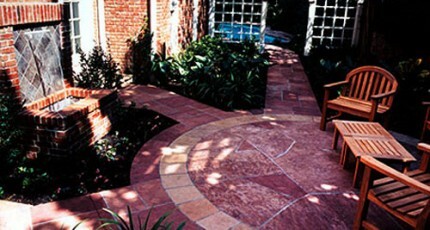 As an approach to a home, pathways tend to be the first insight into the homeowner’s personality. Landscape lighting. The right landscape lighting is often recommended as a relatively inexpensive way to increase your property value. It allows you to showcase beautiful trees and garden elements, but, at the same time, lets you leave some things dark thus controlling what you don’t want people to see. From a practical standpoint, it provides security and safe access. Outdoor water fountains. Outdoor water fountains make a graceful statement about a home by creating a pleasing and welcoming ambiance. They are especially beneficial as camouflage for traffic, humming air-conditioning units and noisy lawn mowers. The Houston area is filled with a fascinating variety of trees, from the graceful river oaks to small ornamentals. Their chances for survival are much greater with some preservation and conservation efforts. Trees face three main offenders when it comes to their survival during construction. Compaction is the main killer of trees caused by construction vehicles and materials, both during and after the construction of a home or building. Foot traffic is also a culprit when it comes to compaction. Root damage, the second main cause, can come from a variety of activities, but generally it is due to digging for foundations, swimming pools, landscaping, irrigation systems, drainage systems and landscape lighting. The third tree-killer is soil contamination which is normally due to construction materials, such as cement, lime, paint, turpentine or acid, being stored or dispensed around trees. Eventually, these materials leach into the soil and kill the trees. In Houston, storm drainage issues are very serious due to our heavy clay soils, flat topography, and heavy forested lots compacted by years of construction that have increased impermeable surfaces. These factors have caused more streets and homes to become flooded during torrential rainfalls. Recently, local regulations are beginning to follow the standards used by the Memorial Villages that require temporary drainage systems, minimum pipe sizes, flow rates, calculations, engineered drainage plans, topographic maps, and as/built plans. “If drainage contractors embark on a drainage project without a complete understanding of these demands, homeowners may find themselves in the middle of a big mess that can cost thousands to rectify,” says Jeff Halper with Exterior Worlds. Exterior Worlds can help with your urban landscaping needs. Since 1987, Exterior Worlds has been providing high-end landscape design and services for Bellaire, River Oaks, West University, and other fine neighborhoods in the greater Houston area.